Zak Munton (stripes) in action for Peterborough Northern Star at Cogenhoe on Saturday. Photo: Chantelle McDonald. @cmcdphotos. 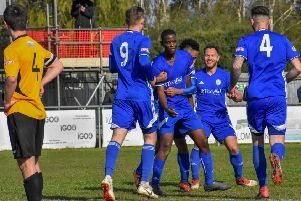 Stamford AFC have the toughest task Division One South of the Evo Stik League can offer as they visit unbeaten leaders Basford tonight (November 20). Nottingham-based Basford have won 13 of their 16 league games to establish a 10-point lead at the top of the table. But the three draws they have completed have all been on their own artificial so in-form Stamford travel in hope. The Daniels would move up from 10th to seventh with a win. Peterborough Northern Star will hope a change of manager will lead to a change of fortunes when they visit Yaxley for a United Counties Premier Division match tomorrow (November 21). Raff Mazzarella is back in charge while Star search for a new manager to replace Rob Ward who was sacked over the weekend after overseeing four straight defeats. But Yaxley have won all three matches since they replaced Brett Whaley with Andy Furnell, including a 3-0 win over Star in the FA Vase. Holbeach United could jump from fifth to third with a positive result at Boston Town tomorrow when there’s also a first round Hinchingbrooke Cup tie between Bourne Town and Eastern Counties League side Ely City at the Abbey Lawns. Division One South: Basford Utd v Stamford. Premier Division One: Boston Town v Holbeach United, Yaxley v Peterborough Northern Star. First round: Bourne Town v Ely City.